If you’ve spent any time with cats, you’ve probably noticed that they spend a lot of quality time snoozing. In fact, cats sleep anywhere from 13 to 16 hours per day. In other words, your friendly companion feline spends approximately 2/3 of his entire life in dreamland. Cats sleep more than almost any other mammal. Realistically, your cat sleeps about twice as much as you do. How much an individual cat sleeps depends on his age, hunger, the temperature and the weather. Like humans, cats go through both Rapid Eye Movement (REM) and non-REM sleep. Although no one can actually ask a cat, the assumption is that your cat dreams during REM sleep. You may notice his whiskers twitch or his eye moving behind his eyelids. The deep non-REM sleep is when the cat’s body grows and repairs itself. As with other aspects of your cat’s behavior, you should pay attention to how much he sleeps. 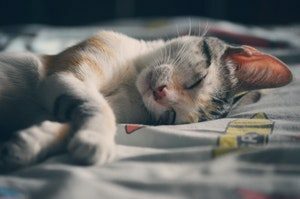 Some variation in sleep habits is normal, but if you find your cat is sleeping more or less than usual, it may indicate a problem. If you notice any change in sleep habits, you should contact your veterinarian. A cat that seems lethargic or depressed may be ill. Conversely a cat that is sleeping less than usual may have a thyroid problem. Although dogs are more often hypothyroid (meaning they don’t have enough thyroid hormone), cats are more likely to be hyperthyroid (meaning they have too much thyroid hormone). Because the cat is producing extra thyroid hormone his metabolism goes up, and he sleeps less. Most cats, particularly house cats, do a lot of their sleeping at night. People who have cats that wake them up in the middle of the night often say their cat is “nocturnal” although that’s not technically true. Cats are “crepuscular,” which means they are most active at dawn and dusk. They do their hunting at these times because their prey is most active. During the heat of the day, the cat is asleep. Although they have good night vision, cats can’t see in complete darkness, so they tend to sleep then as well. Of course, you also can inadvertently reward your cat for getting you up too early. If you feed her in the morning, don’t feed her right after you get up. Don’t ever respond to a feline demanding that you get up either, or you are doomed to be awakened by your cat forever. Finally, if your cat has turned around her schedule, so she is on “the night shift” wake her up during the day and play with her. After all, the animal needs 16 hours of sleep, so it’s got to happen sometime.